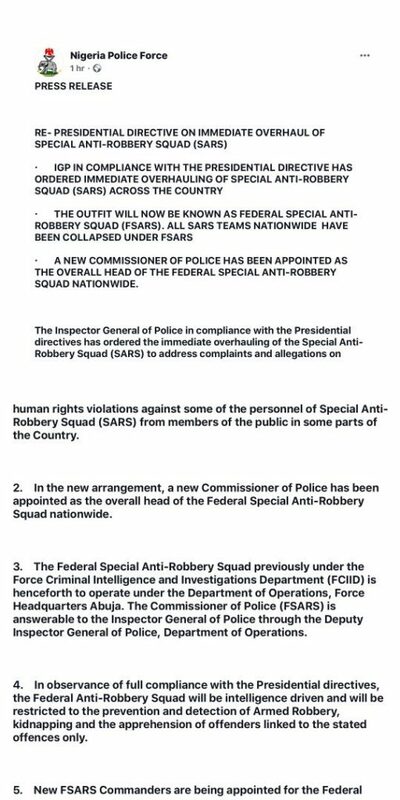 The Inspector General of Police, Ibrahim Idris, has renamed, restructured SARS hours after Acting President Yemi Osinbajo – @ProfOsinbajo ordered the overhauling of Special Anti-Robbery Squad (SARS). The Inspector General of @PoliceNG has swiftly acted on the instruction by appointing a new Police Commissioner as the overall head of the Federal Special Anti-Robbery Squad nationwide. “The Federal Special Anti-Robbery Squad previously under the Force Criminal Intelligence and Investigations Department (FCIID) is henceforth to operate under the Department of Operations, Force Headquarters Abuja. The Commissioner of Police (FSARS) is answerable to the Inspector General of Police through the Deputy Inspector General of Police, Department of Operations. 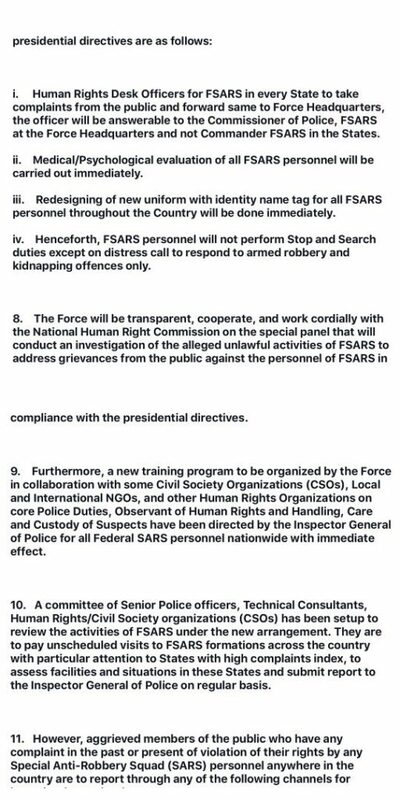 “New FSARS Commanders are being appointed for the Federal Anti-Robbery Squad (FSARS) across the country that will now exist and operate in the State and Zonal Commands under the Commissioner of Police (F-SARS) at the Force Headquarters, Abuja. A Federal SARS Commander of a Rank of Chief Superintendent of Police (CSP) but not below Superintendent of Police (SP) will be in charge of FSARS in State and Zonal Commands across the Country. 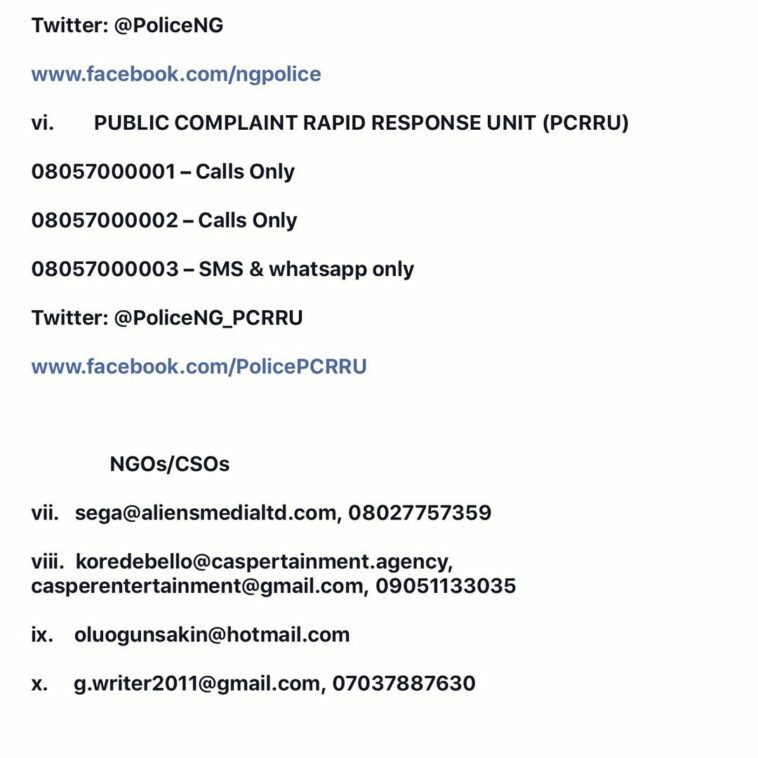 “All Commissioners of Police have been directed by the Inspector General of Police to comply with this directive with immediate effect and warn their personnel not to pose as SARS operatives. The IGP X-Squad and Monitoring Unit have been mandated to go round the Commands and Police Formations nationwide to ensure strict compliance with the Presidential directives and apprehend any erring police officer. “A committee of Senior Police officers, Technical Consultants, Human Rights/Civil Society organizations (CSOs) has been setup to review the activities of FSARS under the new arrangement. They are to pay unscheduled visits to FSARS formations across the country with particular attention to States with high complaints index, to assess facilities and situations in these States and submit report to the Inspector General of Police on regular basis.